We stock and sell many rainwater harvesting systems which are manufactured here on site in the UK. 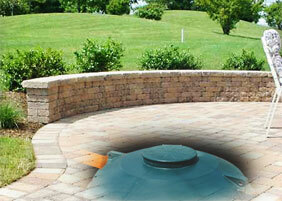 We offer a size range in both aboveground systems and underground systems. For domestic household applications to commercial, industrial, agricultural and farming applications. No matter how much it rains in Britain we always seem to need more water for our plants and gardens. 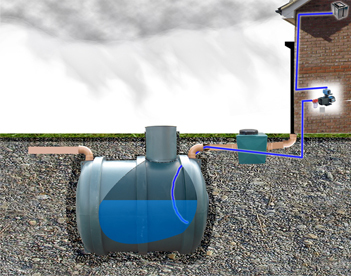 By collecting your rainwater in an underground water tank, you we have a constant supply of water. These rainwater harvesting systems can be connected straight into you existing irrigation system them will never have to worry about your plants and garden not being water when you're on holiday. Once your system is setup there is no end to the uses of the water you save. You can connect a pressure washer to the tap outlet and use the rainwater to wash your car or even clean your patio. 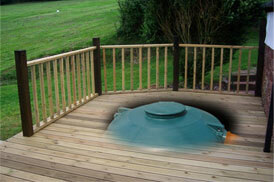 Underground water tanks don't have to be sunk in ground, they can be installed under patios or under decking as shown (right). All accessories such as water pumps, filters and fittings can still be installed. Why not use rainwater to flush your toilet? Or use rainwater to clean your plates?. Rainwater has many uses in the home this is just some of them. Once you have collected the water in the tank how do you get it out? The water pump inside the house will extract the water from the tank and then pump it up to where you need it.